Help CentreUsing SuperControl Tactical pricingHow do I add a voucher code? Vouchers are the perfect way to create discounts unique for a specific group of previous and/or potential guests. 1. Go to Vouchers/Offers > Generate vouchers. 4. Valid for: Choose whether the voucher is valid who are booking between a chosen date range or people whose holidays falls between a chosen date range. Minimum nights: Select if the voucher should only be applicable for bookings that exceed a certain minimum stay. For example, if you only wanted the voucher to be allowed for over 7 night bookings then select 7. Start date/Expiry date: Enter the date range that the voucher is valid for. If you have selected that the voucher if valid for "Booked between" and enter a date range, then it will only be valid if a guest books between that date range. Properties: Should the voucher apply to all properties? If not, then untick the box click on the title "Properties" and manually select individual properties from the list. Hold the Ctrl key to select more than one property (For Mac users hold the Command key). Do not apply if prices are discounted: If your already have a discount applied to your prices then tick this box to exclude this voucher from being allowed. 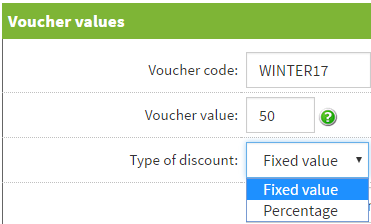 Expire after one booking: If the voucher code is on a first come first served basis then tick this box. If you would like to offer this voucher code to many people then leave unticked. Owner/commission settings: (Agency users only): Select how the discounted price should calculate your owner payments/commission. Website specific: If you have multiple websites in your account you can highlight the site that should be allowed. Notes: Add any notes about this voucher. How do I do a mailshot to my database to send a voucher code? Prev: What's the difference between a special offer and a discount? Next: How do I copy prices? It would help if I could find the section of SuperControl where I can set up the voucher/offer. Your instructions say Go to Voucher/Offers but I am unable to find it. Is it even available in my version of SuperControl?? Your SuperControl account is currently on our LITE package. With this package you don't have the Vouchers/Offers menu. If you're interested in upgrading to our PLUS package please email sales@supercontrol.co.uk.